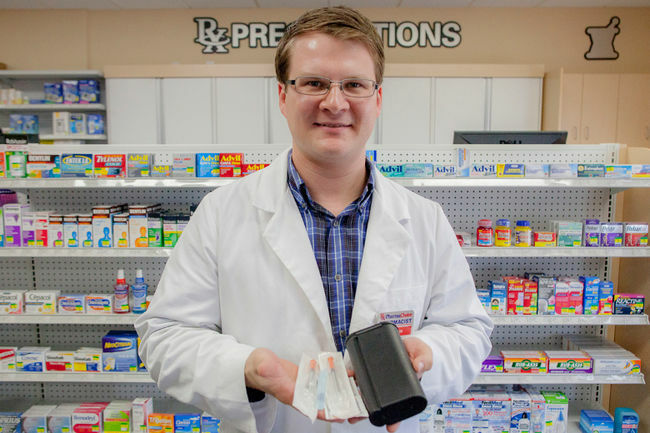 Whitecourt is part of a collection of rural towns and municipalities included in the rollout of the province’s first rural-based harm reduction program. Sarah McNicoll, client support and outreach for Edson, Hinton, Whitecourt and area with HIV West Yellowhead, said there is a need in the region for a harm reduction program targeted at people who use injection drugs. The program seeks to curb the health-risks associated with injection drug use by providing safer injection kits. Life Med Pharmacy in Whitecourt has agreed to be a distributer of these kits on behalf of HIV West Yellowhead for those who need them in Whitecourt. While all drug abuse carries with it personal and community health risks, McNicoll said that injection drug use carries the added risk of contracting a blood-borne illness. The two chief ones that HIV West Yellowhead is concerned with is HIV, the virus that causes AIDS and Hepatitis C.
Trevor Bills, pharmacy manager at Life Med Pharmacy, said that he agreed to participate in the harm reduction program because he said it is a valuable part of promoting community health. McNicoll said they decided to build the program after finding a need in the region. She said that in rural communities people who use injection drugs may not be as visibly confined to a single area, as they might be in a city. Right now McNicoll works out of her home in Edson. She said when a client calls she’ll arrange a spot to meet them and typically give them as many kits as she can spare. “Because the community is somewhat isolated, the best way to get supplies to them is through peer-distribution,” said McNicoll. This pilot phase though is just a stopgap measure. Andrea Watson, executive director of HIV West Yellowhead said that ultimately their goal is to be able to provide harm reduction supplies through local pharmacies. She said the combination of accessibility and discretion offered by pharmaceutical distribution means that more clients are likely to receive supplies. Watson said the program is still in its infancy. The goal now, she said, is to establish stronger connections and networks with the community of those who use injection drugs and to get more local pharmacies on board with distribution. This entry was posted in English and tagged harm reduction program, improving health, injection drugs, Reducing harm by kiumars. Bookmark the permalink.